Welcome to the official UNIVERSE BIOS (also known as UniBios) Homepage. 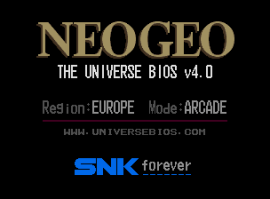 Here you will find all the latest information on the UNIVERSE BIOS for NeoGeo MVS, AES and CD systems. 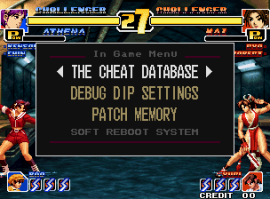 Remember this is not an official SNK Bios, it is a homebrew project aimed at enhancing the experiance when playing on NeoGeo hardware. WARNING! From time to time counterfeit UNIVERSE BIOS are sold separately on eBay, some retrogame forums and other international trading sites. In many cases these do not work correctly for various reasons including alteration and incorrect hardware spec. Official UNIVERSE BIOS are only sold separately from this website. We will never sell the UNIVERSE BIOS on eBay or any other website, webshop or forum. Before you consider buying from any other website, understand you WILL be buying a fake counterfeit copy and not a unique registered original with all the benefits (support, lifetime free upgrades). If you have any questions about the UNIVERSE BIOS eMail info@universebios.com. It has been a couple of years since the last release but the UNIVERSE BIOS v4.0 has finally arrived. Lots of new features (like PICKnMIX), changes and fixes in this new release, for a complete breakdown of whats new and changed see here. 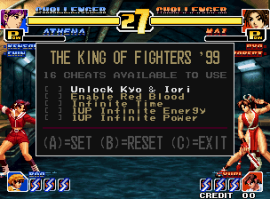 A new version of the UNIVERSE BIOS has been released for the CD systems. For a list of whats new and changes in the latest version see here.